We’re still fighting this out. An advocacy group has filed a lawsuit against Bexar County for misinforming voters about the state’s voter ID rules. The Mexican American Legal Defense and Educational Fund (MALDEF), filed the lawsuit Friday afternoon on behalf of the Southwest Voter Registration Education Project (SVREP). MALDEF attorneys argue that since Monday, October 24, the first day of early voting, Bexar officials have given out false information about Texas’ voter ID rules in polling places across the county and on a recorded message to voters on the elections website. The faulty information, MALDEF attorneys say, does not reflect the current court-ordered voter ID rules and could discourage eligible voters from casting their ballots. 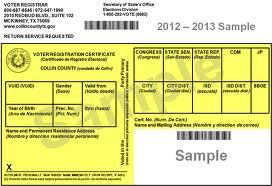 The current rule lets any Bexar County resident vote, even if they don’t have one of seven state-issued photo IDs. Voters can sign a sworn statement at the polls confirming they don’t have an ID, and show another document that proves their residency (like a bank statement). In previous elections, Texas residents were required to show a photo ID before voting. U.S. District Judge Nelva Gonzales Ramos tweaked the requirements for the November 8 election after ruling that the state’s original voter ID rules intentionally discriminated against black and brown voters. Ramos had demanded the state spend at least $2.5 million to swiftly educate voters on the new rules. Texas officials, however, put that money toward posters and pamphlets with misleading information that made these rules appear unchanged. According to the lawsuit, Bexar County has failed to closely follow Ramos’ orders. MALDEF attorneys have demanded the county replace the incorrect information immediately. administrator, Jacque Callanen. Callanen held a press conference on Tuesday, insisting that all incorrect signs had been taken down. But on Thursday, the attorneys allege, nine voting locations still displayed posters displaying invalid voter ID laws and had elections staffers giving false ID information. See here and here for some background, and here for MALDEF’s press release. Though there have been various problems reported around the state relating to voter ID and the way the requirements are communicated, this is the only legal action I know of. By the end of the day Friday, the judge in this suit had granted a temporary restraining order to MALDEF that among other things orders Bexar County to remove the incorrect signs and make sure other materials are up to date. Hopefully everything was fixed over the weekend, but whatever the case I would not be surprised if this in not the last time we hear these complaints. KSAT and KRWG have more. Posted in: Election 2016, Legal matters.